My apartment is full of different, occasionally forgotten, science experiments. Fermenting mushrooms in brine, wet salt packed with lavender and fennel seeds, lemon and lime confit, frozen pig's ears, and a whole army of frozen, unmarked sauces and vaguely brick-colored gravies aging away in my freezer. The latter should probably be thrown out. One of the more useful things I turned up is a mason jar full of dried figs that had been soaking in brandy for 6 or 8 months. In need of an appetizer for a dinner party with some other homebrewers, I ditched the salad idea and grabbed the figs. If I remember correctly, these figs were equally forgotten, and by the time I found them, they had gone from dried to mummified. So I decided to soak them in brandy to soften them back to edibility. I took one pound of mountain gorgonzola and one pound of mascarpone and blended them gently together to form a thick spread. The figs got blitzed in the cuisinart with a cup of walnuts until they were also a chunk-riddled paste. I stirred in some walnut oil, a bit of the now fig-flavored brandy, and maybe 1.5 oz of dark Scharffen-Berger baking chocolate. The chocolate might sound odd, but I wanted to give the figs a slightly robust flavor to smooth out the brandy. To assemble this, I decided to make it in a terrine, so guests could easily slice and serve themselves. A terrine is just a fancy loaf pan created to ease the pain and struggles of making pate. Most terrines are lined with something to keep the filling from sticking, such as bacon or caul fat for meat pates. 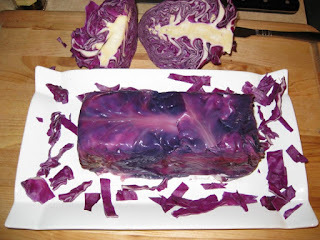 I saw Tom Coliccio use full cabbage leaves in his duck terrine in his "Think Like a Chef" book, and thought cabbage and blue cheese are natural partners. I had a small head of purple cabbage leftover, so I blanched the five largest leaves in boiling water for about 60 seconds, then dunked them in ice water to keep their color. Packed into the terrine and locked down in the fridge overnight to firm up. So here you have it. 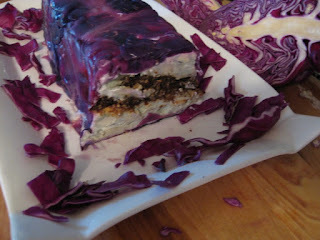 Cabbage wrapping, layering of gorgonzola mousse, center goodness of fig spread, and topped off with more mousse. Served with wheat crackers (as I felt this needed more crunch than bread could provide), the mousse was a hit. The mascarpone, along with making the cheese more workable as a spread, also lightened the flavor enough that non-blue cheese fans were not overwhelmed. The center filling filled(ha!) its purpose by adding some textural components to the creamy cheese, as well as sweetening the cheese and adding some bold opening flavors on the palate. Variations could be anything, like using a saltier blue like roquefort with a lemon zest and arugula filling, or maybe my personal favorite, Rogue Creamery's Smokey Blue. Cold smoked for 16 hours over hazelnut shells...just begging for a bacon and apple relish filling.